"Oh, it would be great if you could have a data feed of businesses in our area!" or "Is there a way we can look up businesses near one of our customers?" A sales engineer / advisor has booked an appointment to go and see a customer, which is not a strange thing to do, the Sales individual turns up at the customer address and they are on a typical business park setting with 10s or even 100s or other businesses. The usual step is to conclude the appointment with a customer, and maybe drop off some information to other business in the location, which is basically door to door uninvited prospecting. But now with eMap 2.0, we have a new way (some would say a complete game changer) to make your sales team more effective and efficient. Your team of field sales people no longer need to prospect by knocking on doors, as with this release for Microsoft CRM, your team can now research the area by looking up businesses that are on the same business park. This data is provided through the MyCRM service, enabling contact to be made with organisations and business research done without buying long lists of data. Once the data has been used it can be converted into a lead record in CRM and prospected, giving your Sales team a head start. Access to real time business data that is up to date is a must-have to a lot of marketing departments and once you have access to a company name a little research can be done to get that initial contact and they can start the process of effective campaigning. 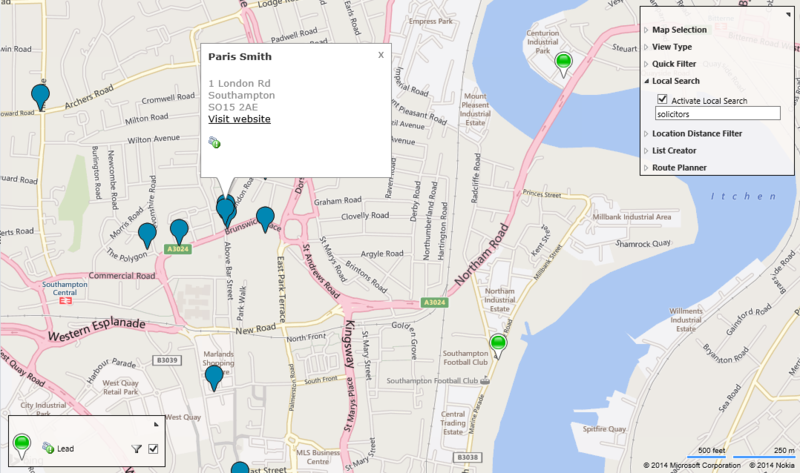 With eMap 2.0 a marketing team can highlight key location areas to see what types of businesses exist and generate pre contact emails through CRM, they can also use the business search to identify businesses by name or by type. Once lead records have been created the data can be easily enhanced by research using services like LinkedIn to get more contacts or Facebook and Twitter to find related information about a company. The screenshots below, show how you can easily combine your own data with data from our external data feeds, which give your business a head start with prospecting.